They — and by “they” I’m referring to horse racing experts along with the Mayans — said he was lucky to beat Union Rags in the 2011 Breeders’ Cup Juvenile. They said he was bred to be a sprinter. They said his running style was all wrong. Meanwhile, Hansen never said a word. Instead, the son of Tapit let his hooves do the talking in last weekend’s Gotham Stakes at Aqueduct... and, boy, what a tale they told. In what may have been the most impressive Kentucky Derby prep to date (at least in terms of erasing doubts), Hansen proved he wasn’t a one-trick pony by laying off the pace for the first time in his career and finishing strongly to capture the Grade III feature by three easy lengths. I agree with the good doctor. I thought Hansen’s performance in the Gotham was outstanding. Not only did last year’s two-year-old champ earn a 105 Brisnet speed figure — two points better than Union Rags’ 103 fig. in the Fountain of Youth — but he also recorded a solid -7 late speed ration (LSR) in the race. Not surprisingly, after closing at 27-1 in pool one of the Kentucky Derby Future Wager, Hansen closed at 9-1 in pool two. We’ve seen it a thousand times (or so it seems) — Ferdinand mowing down the speed in the 1981 Kentucky Derby; Giacomo coming from the back of the pack in the ’86 edition; and Mine That Bird also coming from the clouds to win the roses in ’08. 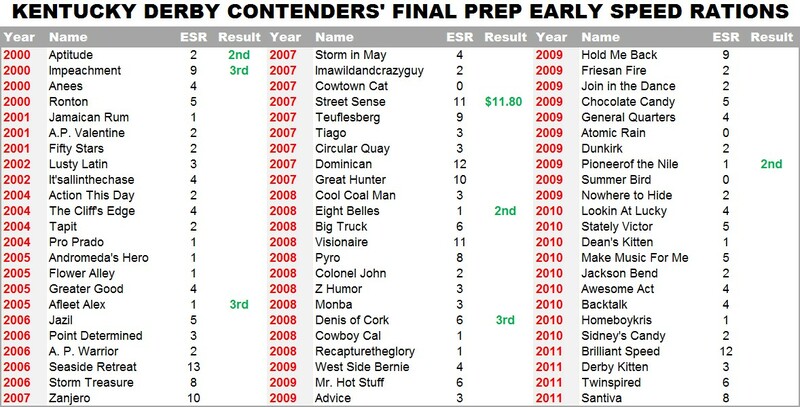 Yet, it might surprise some readers to learn that, since 1975, only three horses — Strike the Gold (1991), Thunder Gulch (1995) and Street Sense (2007) — have won the Derby after recording a positive early speed ration (ESR) in their final prep race. What this means, of course, is that Derby closers are made, not born. 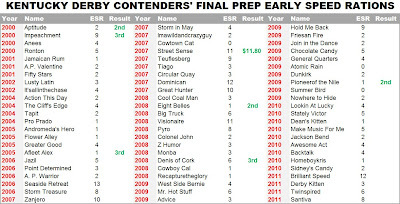 Ferdinand was fifth, five lengths off the pace, in his final pre-Derby start; Giacomo was also five lengths adrift in his last prep, while Mine That Bird was a mere 2 ¾ lengths behind the leaders in his final outing (the Sunland Derby) prior to shocking the world on the first Saturday in May. In fact, since the dawn of the new millennium, just seven of 69 horses (10.1 percent) that recorded a last-race ESR of +1 or greater even hit the board (finished third or better). Sometimes it’s a good thing to be less than zero. CT1 – WIN on 1 at odds of 7-5 or greater. Did not qualify. CT5 – WIN on 4 at odds of 6-5 or greater. Lost. PEN1 – WIN on 5 at even (1-1) odds or greater. Did not qualify. TP11 – WIN on 4 (Ghost Time). Lost. TUP9 – WIN on 6 (Crusaden). Scratched. Suggested Play(s): WIN on 6. $3.20. TAM10 – From a numbers standpoint, WAIT TIL DAWN dominates this event. Not only was her last race faster than anybody else’s, she also earned a -6 late speed ration (LSR) in that affair — the top dirt figure in the field. MODULATE didn’t exactly burn up the track last time, earning just an 80 Brisnet speed figure in her debut (today’s par is a 93), but she did finish with interest (-7 LSR) and she’s bred to go longer. Suggested Play(s): WIN on 4 at odds of 6-5 or greater. $4.40. TAM11 – This race is interesting primarily because I think the odds will be enticing on whomever one chooses to bet. Personally, I’m leaning toward three horses and will consider betting all of them if the prices are right. I’m particularly interested in COZETTI, who I think has the best late punch in the race. However, the son of the grass-loving Cozzene has primarily raced on synthetic and turf surfaces where not much was demanded of him in the early going; so, he’s going to have to prove that he can still motor home after a more demanding opening half-mile. 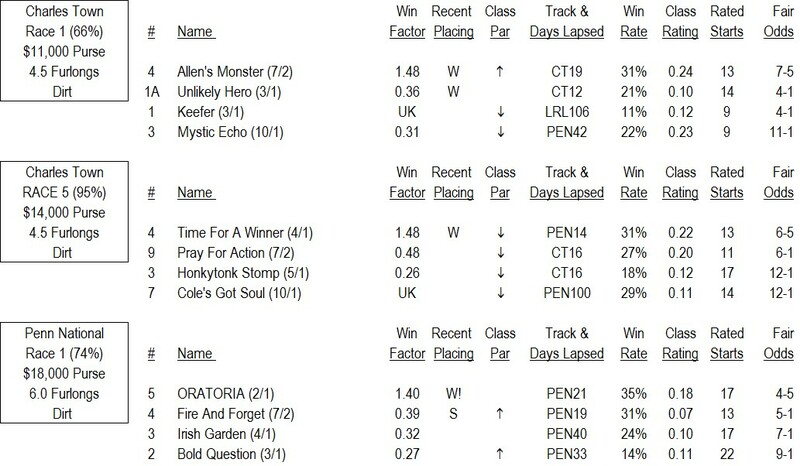 The top choice on my computerized fair odds line (Win Factor Report) is CAJUN CHARLIE, another very intriguing contender. While Louisiana shippers were 0-for-25 at Tampa Bay Downs last year, horses coming from Delta Downs, where Cajun Charlie last raced, did hit the board three times. What’s more, I think Delta’s bullring may have prepared the front-running son of Afternoon Deelites for today’s stretch out to 1-1/16 miles. Lastly, PROSPECTIVE dons blinkers today and has improving late speed rations (LSRs). Suggested Play(s): WIN on 1 (6-1 fair odds), 6 (6-1) and/or 12 (8-1) at or above their fair odds. Lost. TP5 – CHARMING ENDEAVOUR recorded a -7 turn-time ratio (TTR) in his latest, while BIG STAGE and STRATEGIC WEALTH both rate highly on my Win Factor line. Suggested Play(s): WIN on 4. Lost. 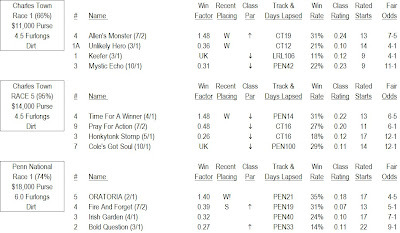 TP10 – HERSILIA is a Win Factor Report “Speed Racer.” BOOZY BIRD and COMMADORE KATE look like good exacta partners. Suggested Play(s): WIN on 8 at even (1-1) odds or greater. Lost. TUP2 – DINA LIGHT recorded a -4 TTR in her most recent race and also has a significant recent speed edge over today’s foes. Suggested Play(s): WIN on 6. Lost. TUP4 – THE PHENOM ran well last time and has some back class. TIGHT END, FLAMING GLORY and ROCKY ICE also look menacing.